Make a BOHO floral chandelier in under three hours and $30! I made my baby girl a floral chandelier for her crib mobile last year and I loved it so much I made another one recently for my sister in-law and her new baby due later this year. 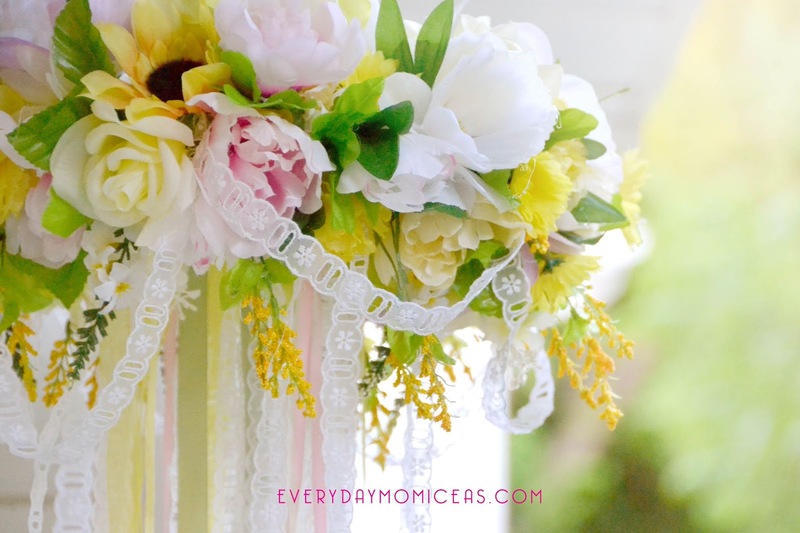 It was the perfect addition to her floral themed baby shower and it's so simple to make. 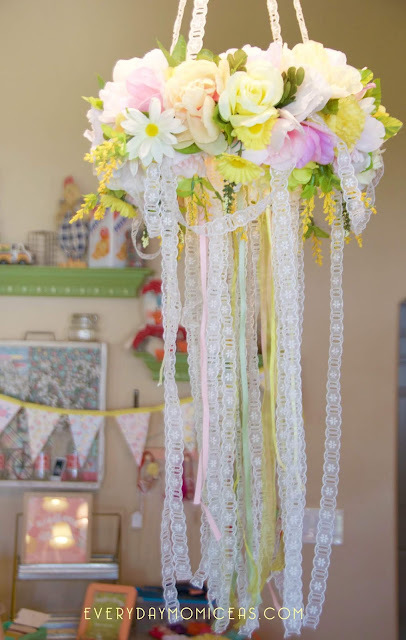 This DIY baby mobile chandelier makes a beautiful statement piece in any room. These also look fabulous as part of your spring and summer decor on the porch or patio. You can get the full tutorial to making your own floral mobile here at this precious post I created. The other mobile in the tutorial is made with staring of pearl beads instead of the different lace strips. You can find most of the items you need at the dollar store, they have the foam wreath seasonal for spring and summer, they have tons of ribbon and faux flowers. You can find a bundle of almost 40 yards of mix match lace on Amazon her for less than $10. 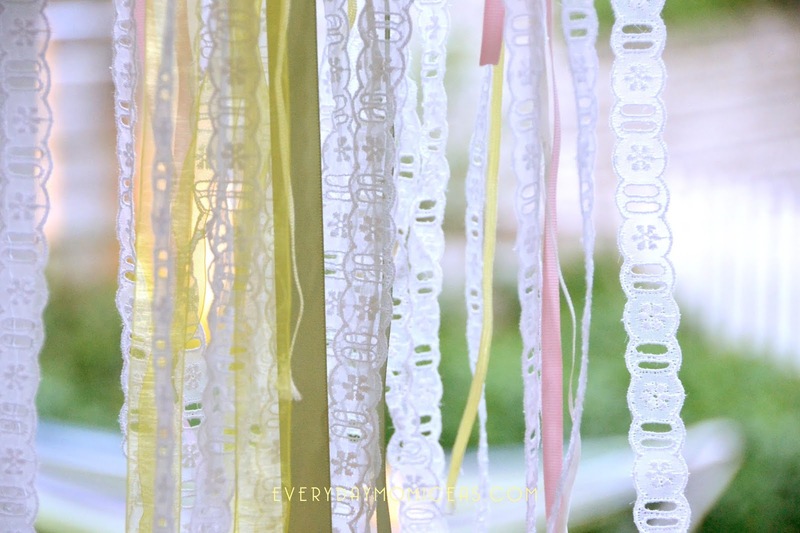 For a more BOHO baby mobile just use 3 foot lengths of lace strips and tie the middle of the lace strip to the fish string. 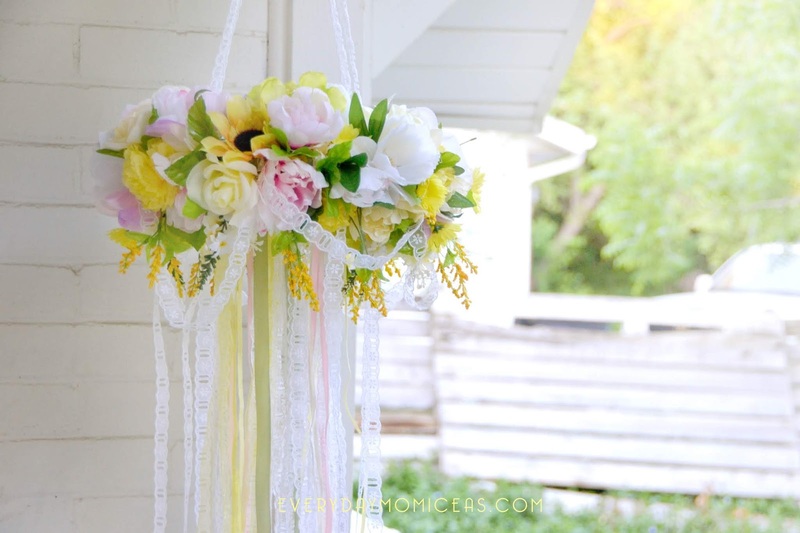 You should have two 18 inch strips of lace hanging down by tying one three foot pice in the middle. To secure the lace in the place you want it to hang just add a little hot glue to the fish line and lace. Tip: Use different types of lace a ribbon for a more eclectic look. 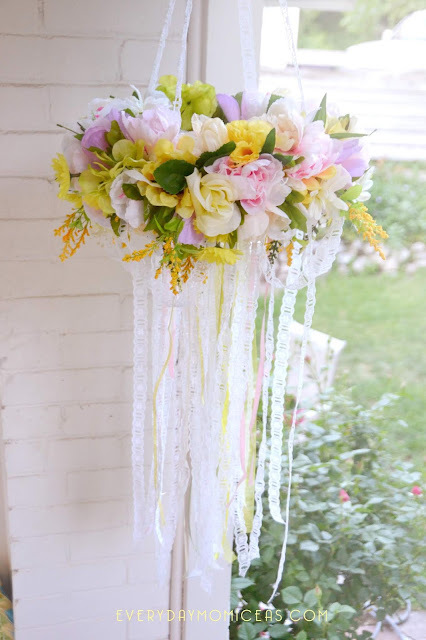 Add a few pieces of lace to the outside foam ring as well so the lace is not just hanging from the very center of the mobile, it will look like a jelly fish if you don't. 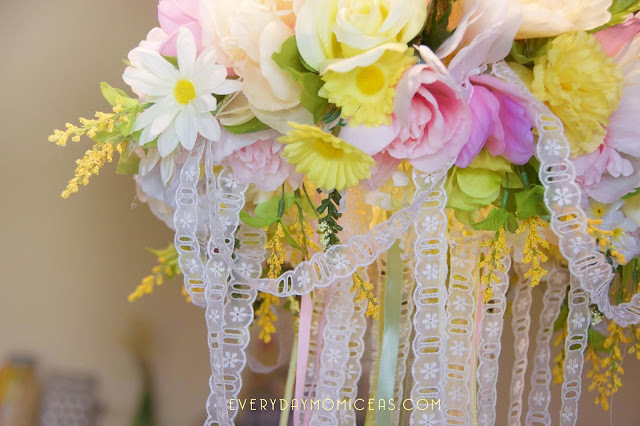 You can also have hanging loops of lace from the foam ring by using one long piece of lace and hot glueing it to the foam wreath every few inches. 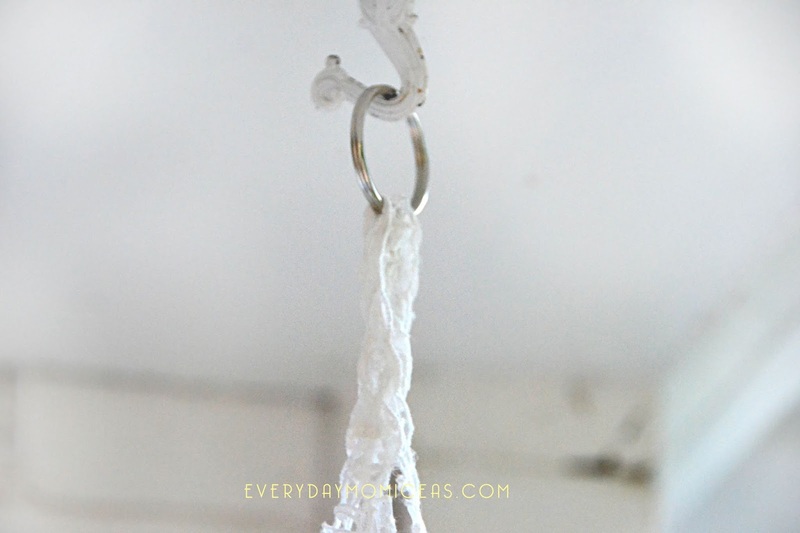 A key ring makes for a great loop for hanging. 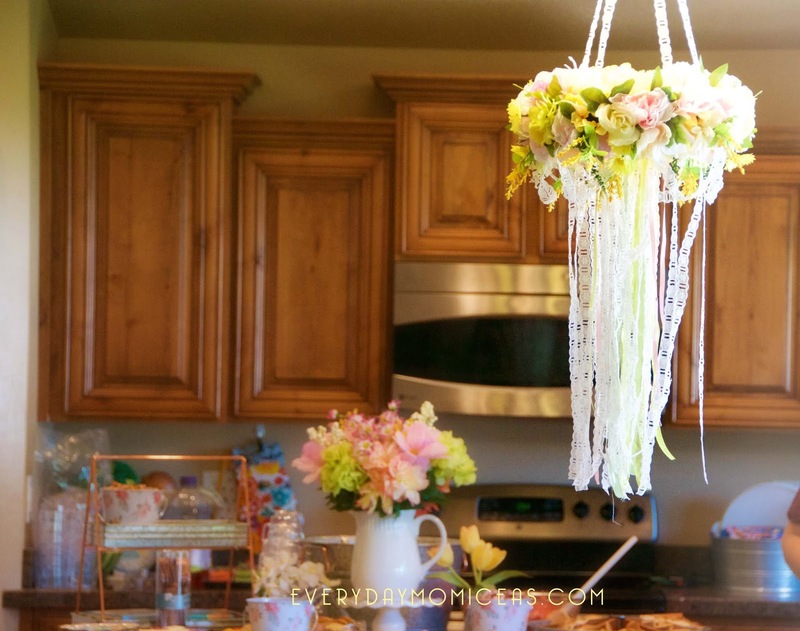 We also used the baby mobile as a chandelier accent piece for my sister in-laws floral themed baby shower. I can't wait to see it over my nieces crib when she arrives. I like the look of placing the drooped flowers on the bottom so they are not sticking up all over the place but hanging down from the bottom for a more elegant look. Tip: Buy the small 6 inch foam ring. You will be tempted to buy the bigger ring but you don't need to. Once you get the flowers on it will expand the mobile to almost a foot and a half. Please let me know if you have any question when making your own boho floral chandelier. I am happy to help. These really are simple to make and not too expensive. These usually cost up to $100 if you buy them from online shops but if you make your own you can find most everything from the dollar store. I only spent $15 on mine but I already owned lots of lace pieces. If you have to buy the lace you are looking at $20 to $30 for the entire project. 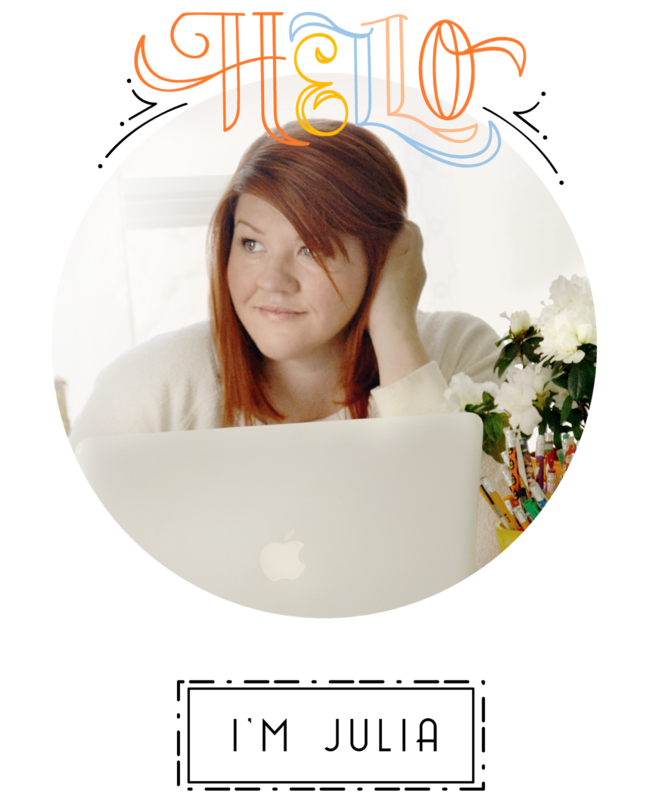 Please share this Pinterest friendly image of this project with your friends and family or save it make for another time. This is so cute! I absolutely love it! And my BFF is due with a little girl next month, which would be so perfect! Thank you for sharing! Im so glad you love it! Hope it helps and good luck to you friend.